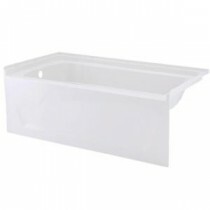 Delivering a sleek, ergonomic design, the Ensemble bath by STERLING provides maximum soaking comfort, with built-in armrests and a contour back that perfectly fits the body's natural curve. The solid Vikrell material construction and high gloss finish resist stains, chips, and scratches. It has a 10 Years Limited Residential/3 Years Limited Commercial warranty.